Q: Pakistan's Prime Minister Imran Khan said during a televised broadcast to the nation on February 27 that his country does not want to see further deterioration of the situation and is ready to cooperate with India on the investigation of the attack in India-controlled Kashmir. He said that war does no good to either side and invited India to come to the negotiating table to resolve the issue. Indian Foreign Minister Sushma Swaraj also said that her country does not want to see an escalation of the situation and will act with responsibility and restraint. What is your comment? What can China do to alleviate tension between India and Pakistan? A: China always believes that all countries' sovereignty and territorial integrity shall be respected, and we do not wish to see any violation against the UN Charter and the norms of international law. The Chinese side is concerned about the escalating tension between India and Pakistan. As you may have noticed, State Councilor and Foreign Minister Wang Yi expressed China's concerns during his talk with the Indian Foreign Minister in Wuzhen and his phone call with the Pakistani Foreign Minister. We urge India and Pakistan to exercise maximum restraint, engage in dialogue at an early date, effectively manage the situation, and jointly uphold regional peace and stability. China has been in close communication with both India and Pakistan on the current situation and making efforts to promote peace and facilitate talks. Like you said, we noted that neither Pakistan nor India wants to see the deterioration or escalation of the situation. We encourage the two sides to meet each other half way and resolve the issue through dialogue. China will continue to play a constructive role in this regard. Q: The second DPRK-US summit in Hanoi ended abruptly. Apparently, they failed to reach an agreement. Do you have any comment? A: I see that you have already come to a conclusion for their meeting? Based on the information released by the US side, my understanding is that President Trump will hold a press briefing. I am just as interested as you are in how the DPRK and the US would comment on their Hanoi summit. Over the past year or so, the situation on the Korean Peninsula has witnessed a major turnaround and the Peninsula issue has been brought back onto the right track of political settlement. This outcome is hard-won and should be cherished. In fact, ups and downs on the Peninsula over the past several decades show that dialogue and consultation is the only way out, and only by meeting each other half way can ensure steady progress on the right course. We hope that the DPRK and the US will continue to engage in dialogue, show sincerity, respect and accommodate each other's legitimate concerns and jointly promote denuclearization and the establishment of a peace mechanism on the Korean Peninsula. China will continue to play a constructive role in this regard. Q: The Mobile World Congress concluded today in Barcelona. Huawei became a center of attention at the congress. 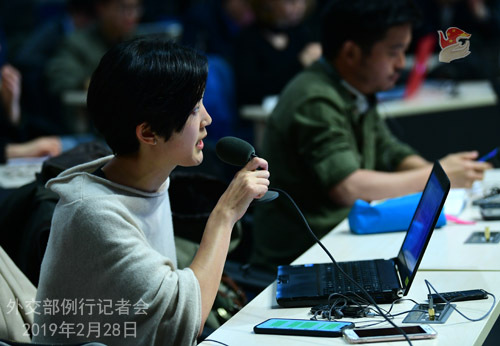 US government officials attending the event asked governments and enterprises of other countries to consider the threat posed by Huawei and other Chinese information technology companies, while failing to present any evidence when requested. On the other hand, it has been reported that Huawei made new progress in 5G international cooperation. It sealed deals with many telecom companies in countries like Malaysia, Indonesia and Saudi Arabia, and jointly launched 5G commercial networks with operators in Switzerland and South Africa. What's your comment? A: Indeed, in the past few days, the media has been following closely the Mobile World Congress held in Barcelona. 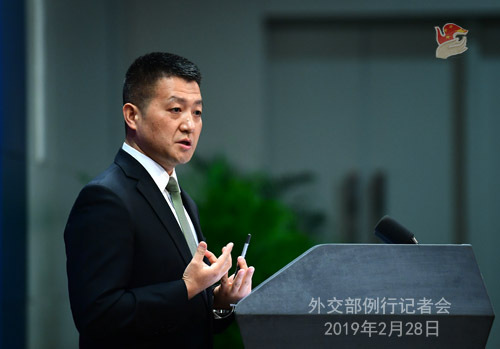 According to reports, Huawei engaged in deeply professional dialogues with relevant governments, industries and businesses during the congress. Cooperation deals were signed between Huawei and foreign enterprises from various countries. I have also seen reports that Huawei, holder of more than 2,500 5G patents, has signed 5G commercial contracts with over 30 operators and shipped more than 40,000 5G base stations globally. These are further testament that the majority of countries are capable of making independent policy choices in line with their interests and that the majority of enterprises are committed to safeguarding a fair and just market environment. As to your question about US officials going all out to hype up security risks posed by products of other countries' companies, I noted that the PRISM program, the CLOUD Act, the Foreign Intelligence Surveillance Act and the Cybersecurity Information Sharing Act of the US were brought up repeatedly at the congress. I wonder what those officials said in response. I for one have not seen any report on that, at least for now. Q: Britain, France and the US have asked the UN Security Council to put Masood Azhar on the UN terror blacklist. My question is, will China block this request as it has done so in the past? A: Like we said many times, the United Nations Security Council 1267 Committee has detailed criteria for the listing and designation procedures for terrorist entities and individuals. China will continue to participate in the discussions of the relevant UN sanctions committee and other subsidiary bodies in a responsible manner. Q: Regarding the second DPRK-US summit, the US said in a press release that no agreement was reached and the working lunch between the two sides was canceled. Some say that this meeting ended with outcomes. What's your comment? A: I just answered a similar question raised by an ROK journalist. To be honest, we are closely following the development of the situation. We noted some comments and media reports, but I hope you will listen to what the governments of the DPRK and the US will say about how they view this meeting later on. I also hope you understand that as the Korean Peninsula nuclear issue has been there for many years, it cannot be resolved easily overnight. Over the past year or so, the fact that the issue is brought onto the right track of political settlement has proved that it is necessary for the two sides to demonstrate good faith, meet each other half way and stay committed to dialogue and consultation. The key is, the DPRK and the US, as two parties directly concerned, should truly respect and accommodate each other's legitimate concerns. As far as I know, based on what we can see from the reports by far, the two sides may continue with their talks at the working level. This is what we hope for. We also hope that the two sides, by truly respecting and accommodating each other's legitimate concerns, will reach positive outcomes that they and all people around the world aspire for. Q: Also a question about the summit. Can you share any details about Chairman Kim's train ride back through China? Do you know when he plans to enter? And who, if anyone, might he meet? A: I remember saying here yesterday that we believe China is not in the position to release information concerning foreign leaders' itinerary on behalf of their governments. Q: Deputy Foreign Minister Ri Gil-song of the DPRK arrived in Beijing this morning. Is he here to coordinate Chairman Kim Jong-un's trip back to the DPRK through China? Will he meet with President Xi Jinping? A: You are a keen observer. At the invitation of the Ministry of Foreign Affairs of China, Deputy Foreign Minister Ri Gil-song of the DPRK pays a visit to China on February 28. During the visit, the two sides will exchange views on bilateral relations and other issues of common interest. Q:Another question about Pakistan and India. 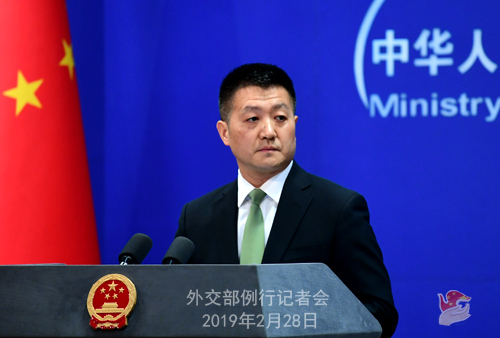 The Foreign Ministry has released a statement about a phone call that State Councilor and Foreign Minister Wang Yi held with the Pakistani Foreign Minister Qureshi last night. I was wondering if you could offer more details about the phone call? The statement said that the Pakistani foreign minister shared the news and developments of the situation. Can you elaborate on what those might be? A: China released information on this phone call very timely last night, or more accurately, early this morning. In this urgent phone call, the Pakistani Foreign Minister briefed State Councilor and Foreign Minister Wang Yi on the current situation and the Pakistani government's assessment and considerations. He also expressed Pakistan's hope that China will continue to play an active role in easing tensions. State Councilor and Foreign Minister Wang Yi stated China's view on the current situation. We are indeed concerned about the current tensions in India-Pakistan relations. State Councilor and Foreign Minister Wang Yi reiterated China's hope that India and Pakistan could exercise restraint and earnestly fulfill their commitment to preventing escalation. He stressed explicitly that sovereignty and territorial integrity of all countries should be respected. State Councilor and Foreign Minister Wang Yi also talked about China's recent efforts in promoting peace and facilitating talks. You may read our press release for more information. Q: The US Senate's Permanent Subcommittee on Investigations released a report yesterday, saying that China's Confucius Institutes should be changed or shut down in the US. What is China's comment? A: Since 2004, the Office of Chinese Language Council International, known as "Hanban", has conducted cooperation with American universities on a voluntary basis and set up 110 Confucius Institutes and over 500 Confucius Classrooms. All the Confucius Institutes in the US are jointly established in American universities in accordance with their voluntary application and in line the principle of mutual respect, friendly consultation, equality and mutual benefit by the Chinese and American universities. The daily operation and management of all these Confucius Institutes are legal and legitimate as well as open and transparent. They have played an important role in promoting China-US people-to-people and cultural exchange and are widely applauded. If you visit any of these Confucius Institutes in the US in person, you will find they are warmly received by local people, schools, teachers and students. Certain people and institutions in the US now try to politicize the Confucius Institutes, a programme for normal cultural and educational exchange between China and the US. This is out of a typical cold-war mindset, which to some extent may reflect their lack of confidence. We hope those people can put in perspective the important role the Confucius Institutes play in promoting mutual understanding between the two peoples, and genuinely take into consideration the legitimate and urgent needs of the American people, including students, teachers and parents, to learn the Chinese language and get a better understanding of the Chinese culture, instead of arbitrarily politicizing the exchange between the Chinese and American people. Q: Yesterday, one pilot of the Indian Air Force was captured in the Pakistani territory, and the Indian government has requested that he should be treated, according to the Geneva Convention, as prisoners of war, and should be returned to India. So how does China comment on this? A: Since yesterday, the Indian and Pakistani media and netizens have voiced some different views on this issue. As for what really happened, we shall not indulge ourselves in making more comments. But I would like to reiterate that as India and Pakistan are both important countries in South Asia, it is very important for them to keep a harmonious relationship and jointly uphold regional peace and stability. The escalation of tensions between India and Pakistan following the recent events is not what we wish to see and is a cause of great concern to us. We hope that India and Pakistan will fulfill their commitment of preventing further deterioration or escalation and come back to the negotiating table at an early date, so that the situation can be effectively brought under control and regional peace and stability will be restored, which serves the interests of all countries. Follow-up: Do you think, as a matter of principle, that all countries should adopt and practice the Geneva Convention in times of military conflict? A: Not just the Geneva Convention. Like I just said, China believes that in dealing with international relations, all countries need to respect the international law and the basic norms governing international relations, including the UN Charter. Q: The second DPRK-US summit has encountered setbacks. What role will China play at this moment? Do you think the Six-Party Talks will be a good choice? A: Just now some of you said the DPRK-US talks have "failed", some said no agreement was reached, and some said there are setbacks. We're following the latest development, and I hope you can first listen to what the US and the DPRK governments say about this summit. We may find what we can do based on their views. As to China's role, like we said, over the past year or so, there has been a major turnaround in the situation on the Korean Peninsula. The Chinese side has been promoting peace, facilitating talks and contributing our propositions and ideas, including the dual-track approach and our consistent efforts to encourage the DPRK and the US to meet each other half way and truly take into consideration each other's legitimate concerns. In fact, since the very beginning of the Korean Peninsula nuclear issue, even in the most trying time, China has been making its utmost effort to encourage the DPRK and the US to resolve the issue through the only viable way of dialogue and consultation and uphold the peace and stability on the Peninsula. The Six-Party Talks you mentioned is an important platform for the solution of the Korean Peninsula nuclear issue, the establishment of which was guided by China with its utmost efforts. The September 19 Joint Statement of the Six-Party Talks was a very good consensus, but unfortunately, it has not been implemented afterwards. We hope all parties can learn lessons from the past, continue the momentum of dialogue, meet each other half way, and jointly commit themselves to promoting denuclearization and the establishment of a peace mechanism on the Peninsula.